Well, I sat down to watch "Scooby-Doo! and the Gourmet Ghost" with my son as he enjoys the adventures of Scooby-Doo, and I also did grow up watching both Scooby-Doo and Scrabby-Doo on the saturday morning cartoons. However, the story told in "Scooby-Doo! and the Gourmet Ghost" was just a run-of-the-mill Scooby-Doo story, one that has been seen hundreds of times before in every single other animated movie and series with the Mystery Gang. Yeah, take it as it is, for better or worse. 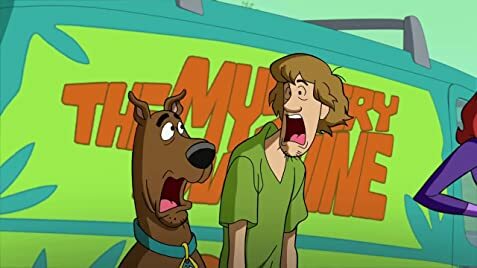 While this 2018 animated Scooby-Doo movie is as generic and predictable as it comes, it does follow that special and unique formula that Hanna-Barbera has founded the entire franchise on. Which definitely gives it a sense of sticking to the core essentials, but it also leaves it with lacking new ideas and innovation. The animation and art style in "Scooby-Doo! and the Gourmet Ghost" is good, as it always is in these animated Scooby-Doo movies. So that definitely counts in favor of the animated movie, for sure. And the voice acting is good, again as it always is in these animated movies. It is always a blast to hear the voice acting talents of Frank Welker, Grey Griffin, Matthew Lillard and Kate Micucci. Now, Giada De Laurentiis and Marcus Samuelsson portray animated versions of themselves, yet I sit here and I don't even know who they are, so I don't get much enjoyment from that. All in all, "Scooby-Doo! and the Gourmet Ghost" is delivering what to be expected from an animated movie of this type. However, I just find it lacking something new to make it outstanding from the numerous other animated Scooby-Doo movies. And that means that I have to settle on a very mediocre five out of ten starts for "Scooby-Doo! and the Gourmet Ghost". Velma says that according to "Old Newport Cove by Henry Metcalf", the Rocky Harbor Inn has been vacant since 1780. In the pre-title sequence the Inn has a British Union Flag (adopted in 1801) and French Tricolour (adopted in 1794) outside.